Our most complete driver is the longest we’ve ever made and can be easily customized to fit every performance demand off the tee. Style and confidence are now tunable. The Classic XL Custom Driver has the largest and deepest club face of any driver in golf with an even larger sweet spot. An adjustable housel and interchangeable weight port allow any golfer to tune the driver for precise performance. Precision Weighting High-strength, lightweight wall construction allowed us to redistribute more weight lower and deeper in the club head. The result is Precision Weighting, which promotes the highest, straightest launch with higher MOI for more head stability through impact. 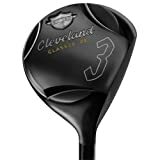 CG Black drivers and fairway woods include Speed Crown Design, the most aerodynamic wood shape Cleveland Golf has ever engineered. A teardrop-inspired profile reduces drag at all angles of airflow during the swing for superior speed. With the proven lightweight performance found in premium Miyazaki graphite shafts and lightweight grips from Golf Pride and Lamkin, players can expect increases in swing speed with the same swing effort. The center of gravity has been moved lower and deeper toward the back of the club head for higher launch angle with optimal spin and playability. The SL290 is lighter and faster, striking a balance between pure head speed and full workability. A forgiving 460cc clubhead is driven by an authentic Miyazaki C. Kua 43-series shaft, producing high-launch and low-spin trajectories for more distance. With the average driver in the market weighing 315-grams, the 290 provides significant weight savings and helps players increase their clubhead speed; in general, dropping just 10 grams of club weight can increase head speed by 1mph. Right Weight Fitting: The SL290 is engineered “Super Lite” – providing distance and control for any swing-type, even those players with the most aggressive tempos. Ultralite Technology: Saving 25 grams compared to the average consumer driver – primarily in the shaft and grip – the 290 helps players generate increased clubhead speeds of 2mph on average. Miyazaki C. Kua Ultralight Shaft: This authentic 43-Series Miyazaki shaft is especially stable in the hands, meaning it can be transitioned quickly and accommodate even the most aggressive swings. Style and confidence are now available in a fairway wood. The Classic XL has a larger sweet spot for incredible distance even when you miss the sweet spot. DEXTERITY: Right-Handed GENDER: Men BRAND: Cleveland MODEL: Classic 270CLUB: Driver, 12* SHAFT: GraphiteSHAFT SPECIFICS: Miyazaki C. Kua 39FLEX: Regular GRIP: Cleveland LENGTH: 45.75 HEADCOVER: Matching headcover included CONDITION: New CONDITION SPECIFICS: New condition 10, head is still in the plastic! Ultralite Technology A- At either 270 or 290 grams, these are among the lightest drivers available on the market. B- Measurable increases in swing speed for more distance with the same swing effort. 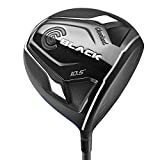 Exceptionally Large, Deep Face Design A- Maximum hitting area with a large percentage of the clubface above the sweet spot. B- Enormous effective hitting area with optimized launch conditions. Improved distance on off-center hits. Miyazaki C. Kua 39/43 Series Shaft With Custom Classic Cosmetics A- One of the lightest shafts in the world includes the premium construction, consistency and performance expected from Miyazaki, the worldwide leader in ultralite graphite shafts. Golf Pride Ultralite 25-gram Rubber Grip A- A breakthrough rubber material offers the feel that players trust with half of the typical driver grip weight. B- Reduces total club weight by more than 25 grams for faster swing speed and more distance. A driver not only has to perform well, but it also has to look right at address and give off a pleasing sound to the ear at impact. The Y-Shape Sound Rib allows for a pleasing sound with higher frequencies. Incorporating Speed Innovation technology into this family of woods makes them lighter, longer and faster than ever before. CG Black – The lightest driver on the market to increase club head and ball speed for increased distance. The new CG Black woods feature an advanced face thickness to reduce the carry loss on off-centre hits. To achieve even greater distance, our engineers lowered the Center of Gravity and moved it closer to the club face to launch the ball higher with lower spin. 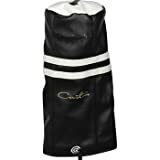 This headcover will fit over any Cleveland Classic XL Custom Driver. This wrench works with the Custom XL or the Classic XL drivers. It comes with the instruction manual as well. Newbie golfers commonly have difficulty choosing the ideal golf driver. The finest Cleveland golf drivers for novices frequently follow the basic guideline that more forgiveness in the shot is much better. 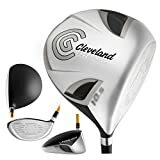 The Cleveland golf drivers above are the finest golf drivers for novices and are completely created for forgiveness. 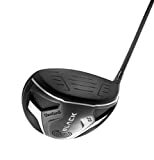 They are, however, the perfect Cleveland golf drivers for more experienced golfers also. Cleveland golf drivers will improve your drive. 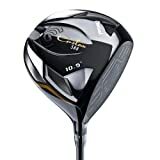 Find more Cleveland Golf Drivers products on Amazon!